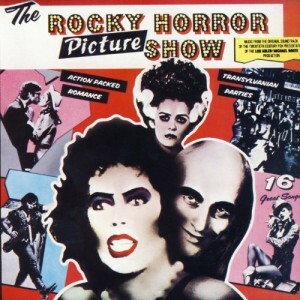 Ode Sounds & Visuals release of the cult movie soundtrack to the 1975 Jim Sharman directed feature film The Rocky Horror Picture Show. This is a single LP reissue of the original soundtrack on red vinyl. Not much is known about this release at the time of this post. Numerous LP’s have been released in the past (primarily by Ode Records but also via a number of other labels) but as far as I’m aware this is the first red vinyl pressing. Note: The track list for this release has not been officially confirmed. Since this is a reissue, the following track list is expected but not official. One Response to "THE ROCKY HORROR PICTURE SHOW Red Vinyl Soundtrack (2013)"
The 2013 American red vinyl pressing of The Rocky Horror Picture Show soundtrack, is the 4th red vinyl version. Australia released the LP on red vinyl in 1978, again in 1981, and a different red for a special promotion in 1981 as well.